Part myrmecophobic nightmare, part post-structural experiment (along the lines of Industrial Soundscape) and all an anti-music video for a couple of songs created in collaboration of David Lynch and Angelo Badalamenti, Ant Head cements its creator's place amongst the boldest of filmmakers working today. 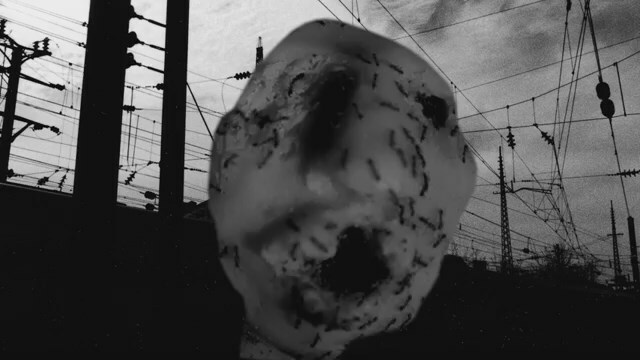 This 13-minute short depicts a deformed head (think the Eraserhead baby's younger, more human brother) that is, reportedly, made of cheese and raw chicken meat, swarming with ants and recalling this writer's close encounter with a large troop of the said six-legged insects during their invasion on a chocolate spread pack. Set against a high-contrast B&W backdrop of utility poles and transmission lines which stand frozen in time (confirming Lynch's obsession with electricity), the creepy fromage noggin turns into a negative-self once Frank 2000 gets abducted by Woodcutters From Fiery Ships (this is no code, but a direct reference to the tracks). The ear-piercing cacophony of avant-garde jazz noise which accompanies the bizarre visuals amplifies the atmosphere of gloom and decay, plunging you into a world parallel to that of the Black Lodge from the Twin Peaks series. A must-see-and-hear for the Lynch completists.